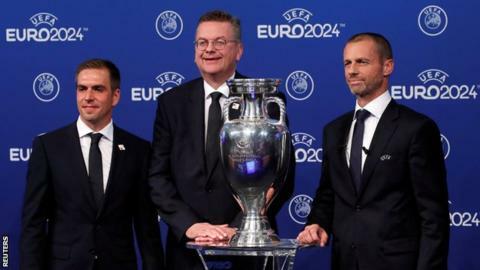 Germany has beaten Turkey to host Euro 2024 after a vote by Uefa's executive committee on Thursday. The two countries made final bid presentations before voting took place in Nyon, Switzerland. The decision means Germany will stage the European Championship for the first time as a unified country, with West Germany having hosted the 1988 tournament. Turkey is yet to host a major international football tournament. It has seen previous attempts to host the Euros in 2008, 2012 and 2016 fail, as well as the 2020 Summer Olympics. Germany staged the 2006 World Cup.